Reports that Hillary Clinton will launch her presidential campaign April 12 raise inevitable questions: Will she be a stronger candidate now than she was in 2008? And which factors may help – or hurt – the former secretary of state in a second run for the White House? A poll last week by the Pew Research Center found that 59% of Democratic voters said there was a “good chance” they would vote for Clinton. That is higher than the 52% of Democrats who said there was a good chance they would back Clinton at a comparable point in 2007. The bigger change, by far, is the state of Clinton’s possible Democratic competition. In early 2007, a first-term senator named Barack Obama was already running for president – and 32% of Democrats saw a good chance of supporting him. By June of that year, Clinton’s advantage on the “good chance” measure had narrowed to 10 points over Obama and former Vice President Al Gore (44%, versus 34% for each). Today, no more than about one-in-five Democratic voters see a good chance of voting for any other Democrat: 22% say there is a good chance they would vote for Vice President Joe Biden, and about the same proportion (21%) say this about Sen. Elizabeth Warren of Massachusetts – and neither has shown serious signs of running. Support for Clinton dwarfs that for the three lesser-known figures in the Democratic field who have suggested they are running: Just 8% say there is a good chance they would vote for Sen. Bernie Sanders of Vermont, a Democratic-leaning independent, with even fewer supporting former Sen. Jim Webb of Virginia (2% good chance) or former Maryland Gov. Martin O’Malley (1% good chance). As was the case in 2007, there are demographic differences in Clinton’s support among Democrats. 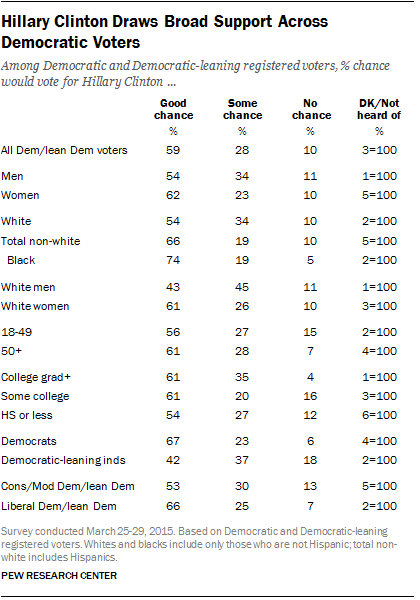 In particular, although 54% of white Democratic voters say there’s a good chance they’d vote for Clinton, that number rises to 66% of non-white Democratic voters – including 74% of African-Americans. In February 2007, 62% of African-American Democratic voters said there was a good chance they would vote for Clinton; 34% said the same about Obama, who was less well-known. Looking at the broader electorate, Clinton also has more strong support than any potential GOP contender in the 2016 general election. A third of voters (33%) say there is a good chance they would vote for Clinton (52% say there is at least some chance). Just 12% say there is a good chance they would vote for any of the possible Republican candidates. Clinton has been in the public spotlight for more than two decades. Her personal favorability ratings have fluctuated a great deal over this period – from her tenure as first lady, through her election as a U.S. senator, and finally during her years as secretary of state. Gender. Even before Clinton’s announcement, there was a gender gap – among Democrats – in views of Clinton. Fully 61% of white Democratic women say there is a good chance they would vote for Clinton, compared with 43% of white Democratic men. To be sure, white Democratic men haven’t ruled out voting for Clinton – only about one-in-ten white Democrats, men and women, say there is no chance they would vote for her. But at this stage, more white Democratic women strongly support her. The possible history-making aspect of Clinton’s candidacy also registers more strongly with Democratic women than with men. In a recent Pew Research Center survey, 69% of Democratic women, but just 46% of Democratic men, said they hope the U.S. elects a female president in their lifetime. Republican women and men – perhaps already contemplating a possible Clinton campaign – were far less likely than Democrats to say they were hoping for a woman president. Most Republican men (80%) and women (76%) said it did not matter to them if a female president is elected in their lifetime. The ‘Clinton factor.’ At this early stage in the campaign, few people seem bothered by the Clinton family’s long involvement in Democratic politics, or by Hillary Clinton’s role in her husband’s administration. Asked in the current survey about the large role the Clinton family continues to play in the Democratic Party, just 11% of Democrats and Democratic-leaning independent voters say they are bothered by this, while 88% say it does not really bother them. This is similar to views in a March 2014 survey conducted by the Pew Research Center and USA Today, when 51% of Democrats and Democratic leaners said that Hillary Clinton’s involvement in the Bill Clinton administration would help her if she decided to run for president; just 11% said it would hurt her and 37% said it would not make a difference. When people were asked in an open-ended format about the most positive and negative aspects of Clinton’s career, 12% volunteered her experience as secretary of state as the one thing they viewed most positively. Yet 15% cited “Benghazi” – Clinton’s handling of the 2012 attack on the U.S. consulate in Benghazi, Libya – as the most negative aspect of her background. In general, extensive Washington experience appears to be a less attractive attribute for a presidential candidate than it once was. At about this point in the 2008 campaign, 35% said they would be more likely to support a candidate who has been an elected official in Washington for many years, while 15% would be less likely; 45% said extensive Washington experience wouldn’t matter. But by last year, those views had changed. More Americans viewed lengthy Washington experience as a negative (30%) than a positive (19%) for a presidential candidate; 48% said it wouldn’t matter. Among Democrats, Republicans and independents, the share saying they would be more likely to support a candidate with many years of Washington experience declined between 2007 and 2014.